Good location and friendly and cooperative staff. Flush in one of the toilet stopped working after one night. Great Employees, But I usually get more from a two star hotel. They were very helpful when I told them that I left my wallet in that shuttle. And the shuttle driver was also very, very nice. If you're going to serve breakfast whether it is free or not you shouldn't just serve a bunch of unhealthy sugary food in the morning with 0 protein. Great location, attractive clean room, but the air conditioner was very noisy. I told the staff about the ac when we checked out and they said that they would do something about it. Good location, attractive clean room. The air conditioner was very noisy. 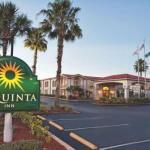 The pet-friendly La Quinta Inn Orlando International Drive North is one block from the Wet n' Wild water park and offers 155 rooms at an affordable price designed for families or couples on vacation. Items included with the room rate at this two-story hotel are a Bright Side breakfast, shuttle service to some of the theme parks, high-speed Internet access, local telephone calls and parking. The hotel is three miles from the Orange County Convention Center and within walking distance of the Belz Factory Outlet Mall and the, Mercado shopping center. Other landmarks and attractions include the Walt Disney World theme parks, Sea World, Universal Studios, the Islands of Adventure amusement park, the Florida Citrus Bowl, Amway Arena, home of the Orlando Magic basketball team and shopping at the Florida Mall, Prime Outlet Shopping Mall, Fashion Square Mall and the Florida Mall. All the rooms have a work area with high-speed Internet access, telephone with voicemail, television with cable news and movie channels, coffee maker, iron and ironing board, a radio and alarm clock and a hairdryer. This inn has an outdoor swimming pool. The complimentary breakfast is the only meal served here. There is Dennys adjacent to the property and a Sweet Tomatoes and a Red Lobster nearby. The 24-hour front desk has safe deposit boxes and information about the Orlando attractions and events. Other amenities include copy and fax services, a guest laundry and ice and vending machines. It is the location  on the International Drive tourist strip  and the friendly staff that attracts visitors back to this Las Quinta. Clients who return to this inn say the rooms are comfortable, clean and well equipped and the breakfast provides a good start to day of shopping or theme parks. Those here just wanting the Disney theme parks will do better closer to Walt Disney World. But if you want to see more of what Orlando has to offer this maybe the ideal base.